Located 18 miles east of Savannah, lies a peaceful little paradise known as Tybee Island. 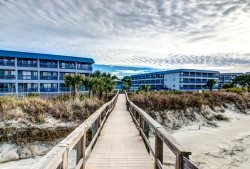 This small barrier island offers three miles of glorious beach, sea oat covered sand dunes, birding trails, marine life, bike trails, fantastic restaurants and nightlife and absolutely magnificent sunsets. Tybee, meaning 'salt,' in Native American, was first visited in 1733 by General Oglethorpe. He saw to the building of the original Tybee Lighthouse, which boasts over 200 years of history and still maintains an active light to this day. Fort Pulaski is located just before Tybee, on Cockspur Island, while Fort Screven stands on the north end of Tybee. Both are open for exploration. The feel of Tybee is casual and laid-back. Be prepared to set your watch to "Tybee Time", meaning you will lose track. The residents here are friendly and warm, with quite a few very colorful characters to keep things interesting. You won't find a McDonald's, Starbucks or Wal-Mart here. The business owners are all local, just as it was in the past, and shopping here is unique and unconventional. Tybee is also very proud of its Marine Science Center and artist community, scattered throughout the island. This is the perfect family vacation spot. The star of Tybee is the sea itself. Any variety of water sport is available here. From surfing to kayaking, body boarding to simply floating around in a raft, and one of the most beloved pastimes, watching it all happen from the beach with a drink in hand. Dolphins can be seen daily, swimming close to shore, as well as any number of fish jumping. Starfish and sand dollars can be found at low tide, along with many other treasures. When the sun goes down, Tybee offers casual to fine dining. The island comes to life with the sounds of local musicians and dancing is highly recommended. No matter what you choose to do on Tybee, that small beach town feel will never leave you. It is said if you get Tybee sand in your shoes you will never leave.